Note: Make sure to Register or Login for Free so you can save your Character. This Page is the beginning of your fantasy novel / game. As with anything else, you need to understand how this works so please do not skip pages. "Herein lies some advice fer thee, ensure ye listen well or it will flee. If ye have read through this first part, the rules and all, then make sure ye are registered as a Member or all will soon fall. If ye have registered in good stead then make sure ye have made thy introduction as is customary. Why an introduction ye ask? So we can separate the delirious from the serious, hence the Dungeon Master must approve all the lively lads and lovely lasses. If ye have done the both, received approval and wish not to waste more time then ye can proceed to create thy Character in quick time by firstly reading through these introductory rectos. Even so, know this... that skipping over things in haste will make thee miss the most important aspects of this bliss. Ignorance will maketh thee a fool if ye get into something without the right tools. Fer knowledge is power and it is in reading one blooms like a flower." 5. Begin making your Character (on this page). Welcome to "Ruler of Kings II" or "ROK 2" or "ROK II" for short. Ruler of Kings is a "Text based Massive Multi-Player Role-Playing Game" or "Text MMORPG". The word "Text" in this case refers to what you write or read. The Role-Playing comes from the choices you make and future interaction with other Players. Even so, your own Character's thoughts, feelings and action are recorded in your Character's journal as part of the story. To participate you create your very own medieval fantasy Character based on some questions and choices you make. In fact, the Ruler of Kings II Text Adventure is far more involved than just making choices as ROK II is not linear. While you do follow a general scenario your character is not bound by a few decisions about where to go next. In ROK II, you can venture anywhere in the world at anytime. What Makes This Text Adventure Unique? 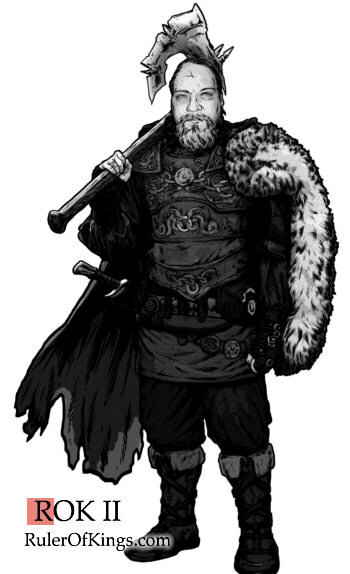 Unlike most Text RPGs, you can also alter (write / edit) the story, cause an unexpected situation, detail your Relationships, Chose a unique Race, Train Familiars, Cast Spells, hire NPCs, control Armies or simply interact with other Players' Characters using Text. In some parts of ROK II you may be asked to write about your character, you can do this in either modern English or Old English- it is up to you. Do not worry, no one here ridicules your words, however you should write in clear readable English as we do not understand dwarven runic or hieroglyphics. If you optionally wish to write in Old English for speech you can use this guide: Being The Author: Writing In ROK II. Once the character is created you will be given a scene in which to further a goal or accomplish a mission. In short, this means you use your reading skills to visualize an engaging scene based on an event that is shown to you. Is This A Fantasy Adventure Novel? Ruler Of Kings II is very much like reading a fantasy novel but instead of relying on the author solely to tell you what actions a character takes you will decide what the character does or says. At a specific point, when your character has achieved a certain status and power, you will be able to have that character interact with other players and their characters. Are There Special Rules To Play? The ROK II rules was created on a very simple system that the Administrator of this site developed for custom RPGs. Therefore, you do not need to worry about any prior knowledge of how to play as it is an easy step by step process. There are "Tip Boxes" throughout the game to help you along.